I started dancing at the age of 3yrs, when Miss Hammond was teaching at a local dance school in Winton. I moved with her when she opened Hammond Academy of Performing Arts in 2006, I am now 15yrs old and still dancing. Over the time I have been with HAPA I have taken part in many shows some in theatres like the Regent Centre, Poole Lighthouse and Bournemouth International Centre with lots of people and some for smaller audiences at Christmas, The Salvation Army, Bournemouth Hospital, Winton Carnival and St Peters Church. I enjoy my lessons at HAPA my favourite classes are Tap and Street because Tap is challenging and Street you can put your own twist on things (sometimes when Miss H and Miss Bianca are not looking!). We work hard (most of the time) rehearsing for shows or practising for exams. Miss Hammond is a hard task master but we know she wants us to be the best we can. As I am involved in many classes I have gone through many pairs of shoes and my mum will be glad when my feet stop growing. Miss Hammond will be glad when I stop growing altogether as I am now taller than she is. I have been coming to The Adult Ballet classes at Hammond Academy for many years now and Miss Hammond still finds plenty of faults to help me with! But she is always very keen to encourage and teach me even though by now, at my advanced age, I may be a lost cause. I always enjoy her classes because she covers many different steps and techniques so the classes are never boring. She is very good at encouraging everyone whatever their level of ability from beginners, to pupils with much more experience and sadly the faults to go with it. I always come away from class feeling that I have worked hard but it’s been really enjoyable and worthwhile. Miss Hammond has even talked me into participating in some of her bi-annual shows which I have thoroughly enjoyed. I have been at Hammond Academy of Performing Arts for 11 years. Over these years I have learnt many styles of dance including: Classical Ballet, Ballroom, Latin American, Hip Hop, Modern Theatre, Street and Tap. The moment I joined I fell in love with dancing at HAPA. I enjoy dancing at Hammond Academy because it is such a relaxed and friendly environment, everyone is very welcoming, I also have a fun and enjoyable time there. I like and appreciate how the teachers focus on our mistakes and show and tell us how to fix and improve them. When we do things correctly they congratulate us and make us feel proud of our achievements. During my time at HAPA I have learnt valuable skills and gained great confidence. Every 18 months HAPA puts on a dance show which I thoroughly enjoy as they great experiences, they also create lots of memories and show other people the hard work we have been doing in class. Dancing at HAPA is something I look forward to every week. I have been dancing at Hammond Academy since the age of 5yrs. I am now 16 and can honestly say it is one of the best things I do in my spare time. Not only have I been given opportunities I never thought I’d experience, but also I have made friends for a lifetime and we are all like a family. Since joining Hammond Academy I have studied many different dance styles, these include Tap, Modern Theatre, Classical Ballet, Pointe, Salsa, Polish, Street, Hip Hop and also Musical Theatre. The teachers are kind and very talented. They treat you so nicely and you can feel comfortable around them in class. Miss Hammond has watched me grow up and has helped me gain experiences like dancing at the Light House with Wessex Youth Orchestra which was amazing, annual carnivals, Bournemouth Hospital fetes and so many more. I would recommend Hammond Academy of Performing Arts to everyone, however old you are there are classes to enjoy. I have been at Hammond Academy of Performing Arts for 11yrs now and I have studied various styles of dance. The styles that I have studied are: Tap, Modern Theatre, Classical Ballet, Street and recently I started Hip Hop. I have taken part in various events, shows and taken many, many exams. My time at Hammond Academy has been very enjoyable and I am sure that there is much more to come from it. The teachers are really great, they will always help you to make sure that your dances are the best they can be. I enjoy dancing at Hammond Academy because not only is it extremely fun but you also learn a lot and get so much out of it. The shows we perform are every 18 months are a very enjoyable experience. I love learning the new dances for the shows and being able to perform them for everyone in the theatre. I have been dancing at Hammond Academy for 11 years, since I was 5 yrs old and I have learnt so much. I have made so many great friends and after all these years all members of Hammond Academy are like family to me. At Hammond Academy you can trust that you will always be pushed to your best and will always be set a challenge so it never gets boring. I have stared in 5 big shows with Hammond Academy and all of them have been wonderful and a life changing experience. I have always felt cared for and supported by all the teachers and students at the Academy. Miss Hammond has helped me achieve grades in my exams that I never thought I would and has never given up on me or any other student, she always does everything she can to help. Hammond Academy has the most amazing and most caring dance teachers I have ever met, Miss Hammond, Miss Bianca and Miss Lucy. My confidence over the past couple of years has grown so much thanks to all the teachers and the students. I will always remember Hammond Academy even when I’m 60yrs old, as I have had some of my best memories at the Academy and with the people there. Hammond Academy is an amazing dance school without a doubt. I have been attending Hammond Academy for almost 9 years. I joined while the Academy were rehearsing for its second show. Since then I have taken part many events such as numerous theatrical shows and smaller events such as fetes and carnivals, even taking exams every year in Modern, Tap, Street and Freestyle. It just goes to show the amount of opportunities that are possible. As well as this, I have seen my confidence grow a lot over the 9 years. When I arrived I was a quiet, timid 8 year old. I think this is down to the performing involved and the friendly atmosphere within the school. With the hard work and support given to me, my dancing and co-ordination has improved as well, also allowing me to achieve the best exam results possible. Hammond Academy of performing Arts is the best dance school I have been to! There is a wide variety of dance, drama and lots of other activities. There are lots of HAPA school trips to see performances such as Swan Lake, West side Story and Wicked. The dance lessons are such fun but you also learn so much. Miss Hammond and the other teachers are so amazing and supportive. They show us and teach us so many new things. Any type of dancing you enjoy come along to one of our fun and enjoyable lessons. We love HAPA so much. I started learning tap as a complete beginner and Miss Hammond and all the other ladies in the class made me feel so welcome. I was able to learn at my own pace in a relaxed and friendly environment, which made all the difference. It was great to be able to take an exam at the end of the year, as it showed me how far I had developed and the excellent teaching helped me to achieve the top grade of Distinction. I would recommend Hammond Academy of Performing Arts to anyone looking to take dance classes, whether alone or with a friend. My experience at The Lighthouse was totally different to any other show that I have done because actually performing with a real orchestra was just amazing. I always dreamt about it but I’d never thought it would happen for real. The hardest dance for me had to be the Tchaikovsky one, but if I had the chance to do it all again I would, hands down. The dressing rooms were luxurious, they gave you two different kinds of drink and a box of choclates, then after our parents came to the dressing room and congratulated us. Then Toby and Olli gave me and Eleanor some flowers then we gave them a box of Toblerone chocolate each. It had been a great night. Hi I’m Ollie and I’m 8 years old. Whilst we were practising for our school show, Miss Hammond asked if I would like to dance with some of the other children to music played by the Wessex Youth Orchestra. I said Yes! Lots of practice and many chocolate biscuits later we were ready. On the day we rehearsed at the Academy in the morning, then we went to rehearse with the orchestra in the afternoon, the hall was big. It was quite hard as the music was a bit slower than the CD we had practised to. In the evening Miss Hammond showed us our dressing rooms, one for the boys and one for the girls, the orchestra had left us chocolate and water too. When we got back to the dressing rooms Miss Hammond got us to give the girls flowers and the girls gave us some chocolates. All our parants came backstage to collect us and said they were all very proud of us and that is was an amazing experience. I think it was amazing too! Hello my name is Eleanor and I did a show at The Lighthouse with Jade, Toby and Ollie. I was very happy when Miss Hammond asked me if i wanted to do a show at The Lighthouse. 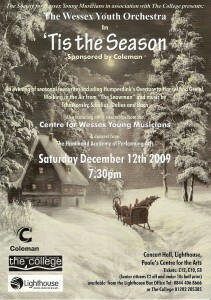 I did nallet next to the Wessex Youth Orchestra on 12th December 2009. We had to practice loys and lots and finally i got it. We danced to The Snowman ‘Walking in the Air’ which Miss Hammond taught us, and Tchaikovsky’s ‘Waltz of the Flowers’ from ‘The Nitcracker’, which Miss Kim Taught us. On the day we had a dress rehearsal. I shared a dressing room with Jayde and then Toby and Ollie shared a dressing room. In the dressing room there were mirrors with lights around, our own toilet, chocolates and drinks. We felt like superstars! It was my first time ever I got to dance next to a live orchestra. I thought they were very good and very large and loud. I felt really excited but a little bit scared. It was a very big audience to perform infrount of. My partner was toby. The frist dance was The Snowman sung beautifully by a little girl. I wore a white leotard and tutu. Miss Hammond did my make-up. The second dance, I wore a blue leotard and tutu. My Mum, Dad and Big sister Tash came to watch me. I felt proud of myself when everyone clapped. Miss Hammond, afterwards gave me some flowers and a card. My family were very proud of me and i was too. I want to thank Miss Hammond for letting me dance. I will never forget dancing at The Lighthouse. It was brilliant to perform at the Lighthouse. It was really great fun that we got to dance to a live orchestra and even there were a few people singing. It felt so grand to be standing there with hundreds of people looking at me happily and enjoying the show. It was fabulous to dance with my friends. We did two dances to Walking in the Air and a Tchaikovsky piece. It was great to hear the audience clapping their hands together because it was such a great show.